Sea Lions show extreme sexual dimorphism. The lighter, longer hair of the crest and upper neck give males a maned appearance, hence sea LION. “Eared Seal” ears are small and cone-like around the ear openings. True seals have no pinnae. Eared Seals have long vibrissae and heavier muzzles than seals, and they are quadrupedal. Appearing black when they are wet, Sea Lions are brown. During the molt, they are blotchy as the sun-bleached old hair is replaced by the true-color new pelage. The woolly pups are coffee-brown to black at birth, becoming their adult color with the 6-month molt. California Sea Lions are found from the tip of Baja to the Alaskan Gulf, primarily along coastlines with sandy or rocky beaches. They predominantly forage the Continental Shelf. Wild – Varied sea life, preferring fish, squid and octopus, but also take crustaceans and urchins. Zoo – Squid and fish (during any time in freshwater, salt pellets/vitamins inserted in the fish). Sea Lions are rarely more than 20 miles out to sea, concentrating activities in areas of cool-water upwelling, where food is the most plentiful. Their populations are greatly affected by the warming seen in severe El Niño years. They seem, however, to recover within 4 – 5 years. They feed on whatever is abundant, and seldom deep-dive. Enemies include sharks, orcas and humans. Sea Lions haul out to rest and to sleep at night, and breakwaters are a favorite. They fold back the cartilaginous extensions on their hind flippers to use the strong claws on the three middle toes for scratching. The front claws are vestigial. Vocalizations are sharp barks, throaty chortles and honks. The breeding strategy of pinnipeds like Sea Lions favors larger-sized males. Large males are better able to defend territories, they need less energy per unit of body weight and can survive long periods of fasting, a necessity since they cannot leave their territories to feed. Larger bulls are more successful, producing more offspring with the DNA for larger size. Sea Lions have no value as fur-bearers, their fur is very short. They are highly adapted to an aquatic life, their modified limbs mostly enclosed within the body. The hands and feet are long, flattened and fully webbed. They move surprisingly fast on land, traveling more easily than true seals because they can stand on sideways-turned hands and feet, actually walking. The structure of the shoulder and arm allows an easy figure-eight for powering the swimming. Steering is accomplished with the hind limbs. Swimming with ultimate grace, Sea Lions are agile, rapid swimmers, catching fast-moving prey. Thick blubber beneath the skin smoothes the shape to the classic no-drag torpedo, provides buoyancy and insulates against cold. All diving pinnipeds show many physiological adaptations that conserve oxygen, including: slowed heart rate, slowed metabolism, dropped body temperature, high tolerance to carbon dioxide in the tissues, myoglobin (able to store large amounts of oxygen in muscle tissues) and collapsing the lungs before the dive. Expelling air from the lungs effectively limits gas-exchange in the lungs, avoiding the condition known as the bends (nitrogen bubbles in the blood) on ascent. The nostrils are slits that are tightly closed and are forced open by special muscles. Incisors and canines are carnivore-like but premolars and molars are peg-like and interdigitated for grabbing and holding. Prey is swallowed whole. The hairless soles of the flippers are well-supplied with blood vessels and sweat glands. The flippers are waved when the animal is hot. Pinnipeds have large eyes and the shape of the lens adjusts for differences in light refraction in air and water. Very long vibrissae (whiskers) may help detect vibrations under water. They are quite stiff and definitely help balance the ball during circus tricks. Hearing is acute. 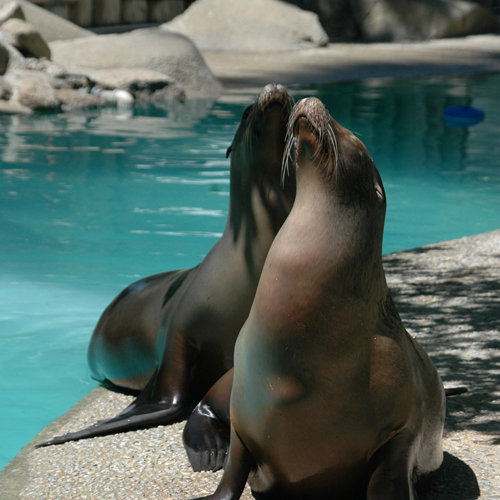 California Sea Lions produce sounds both in and out of water and are known as one of the noisiest Otariids. Otariids are polygynous (“many females”) and bulls maintain a “harem” of 5 to 20 cows for the breeding season. A dominant bull uses the same rookery year after year but each year a new “harem” is established. Bulls arrive first to establish their territories. Cows regularly gather in groups. Dominant bulls defend access to a group of females, the cow chooses the group and the stretch of beach within which she wants to have her calf. A bull cannot actively pursue a cow without leaving his territory. He does his best to keep the cows in his territory from leaving. Cows come ashore 2 to 3 weeks after the bulls, about 2 days before their pups arrive. As each pup is born, the cow will vocalize and sniff at the pup, which responds vocally. This immediate vocal and olfactory recognition is very important for maintaining the mother/pup bond. The suckling pup gets very rich milk (36% fat, 14% protein) and grows rapidly. Cows come into heat about 8 days after calving and leave for the sea to feed soon after breeding. When a cow leaves, her pup moves to the back of the breeding beach, with the other pups. This keeps them out of the way of still-ardent bulls. Pups are often trampled in territorial and breeding scrambles. Bulls are unconcerned because the pups, conceived last breeding season, are probably not his. The mother returns weekly for 4 months, goes to the crèche of pups and calls. Answered with the birth-call, Mother confirms recognition with a sniff and leads the pup to a secluded place so it can nurse. The pups swim in tide pools at first and later go into the sea with their mothers. Cows begin to breed at 3 years of age, the bulls at 5 years or more. A fully crested Beach Master is closer to 10. Life expectancy is 12 to 15 years wild, and 30 in captivity. Lifespan Less than 30 years in the wild. Diet Carnivore - Fishes, squid and octopus. Size 5.5 to 7.25 feet. Weight 610 to 860 pounds. Habitat Inhabit rocky and sandy beaches of coastal islands and mainland shorelines along the coasts. California Sea Lions are common and, under protection of the Marine Mammals Act, the main population (along western Baja and the California coast) is at carrying capacity. They are IUCN listed as Least Concern. Although genetically isolated and non-migratory, the declining Gulf of California population is still counted as part of the total population. It is being monitored and its status may change in the future. California sea lions can swim at speeds of up to 25mph and run faster than a human.